Fans of Indian motorcycles are a breed apart. These people are fiercely loyal and still enjoy motorcycles built in the 1940s as if they were the hottest new thing out there. One way that motorcycle enthusiasts express their tastes is with custom or collectible belt buckles, and there are a number of them that Indian motorcycle fans will like. One type of Indian motorcycle buckle is a 6.5 x 2.5 inch profile N24 Indian head with “Indian” in red script written on the headdress. You can get it for around $15 (US). You can also get an Indian script retro-style pewter belt buckle with chip-proof enamel. It fits a standard belt up to 1 3/4 inches wide, and is made by Bergamot Brass Works of finely sculpted, lead-free pewter. This type of buckle costs around $50. For about half as much, you can buy a 3.25 x 2.5 inch buckle that fits belts up to 1 3/4 inches wide that depicts an eagle and an Indian overlaid on an American flag. 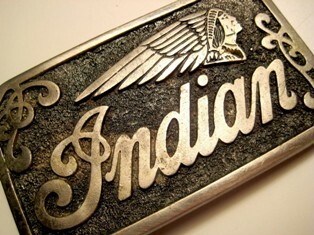 The back of the buckle is inscribed with the words “Indian – Brothers In The Wind.” The buckle is made of pewter with enamel color and is officially licensed by Indian Motorcycles International. It costs about $25. Twenty-five dollars will also get you a 3.25 x 2.5 inch buckle that shows an Indian Chief motorcycle with skirted fenders and an Indian head and “Indian” written in red script. This buckle is also made of pewter with enamel detail. An oval buckle measuring 3 3/4 inches long and 2 7/8 inches tall with a black background, logo and “Indian” in script in silver, and a chrome border of motorcycle chain links is made to handle standard belts up to 1 1/2 inches wide. It costs $17. A freeform “Indian” script belt buckle made of pewter with enamel color is a simpler design for a more understated look. This buckle costs $50. This is by no means an exhaustive list of Indian motorcycle buckles. The popularity of Indian motorcycles has given rise to many types of collectibles and many ways for those who love Indian motorcycles to let the world know about these marvelous bikes.